Chocoholics beware! 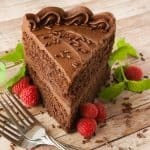 This Death by Chocolate Cake recipe is the only one you will ever need! Why, you ask? Try it and find out! Prepare two 9 inch cake pans by greasing and flouring them or by lining the with parchment paper and spraying them with non-stick cooking spray. Prepare the 1 cup of boiling water and set it aside for a moment. In a mixing bowl, whisk together the flour, sugar, cocoa powder, baking powder, baking soda and salt. Add the eggs, canola oil, milk and vanilla. Mix well. With the mixer or beaters running pour the boiling water into the batter in a small steady stream. Mix until well combined. Divide the batter between the two cake pans. They will be quite full. Bake your chocolate cakes at 350 for 27-30 minutes. A toothpick should come out with moist sticky crumbs, not clean. Cool on wire racks for a half hour, then turn out of the pans to finish cooling. Frost with my Rich Chocolate Buttercream Frosting.